And yet another I wrote up back in March but didn't post. Weird. Like I said, got to go down to Austin, Texas for a minute. 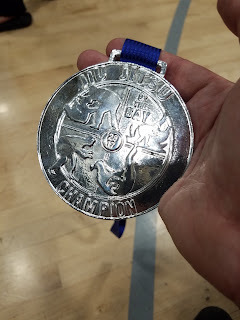 But I also had my first BJJ tournament coming up on April 2, Jiu Jitsu By The Bay, so I had to keep the training up. Luckily, there's some great BJJ down in Austin, and I was lucky enough to get over to Gracie Barra in North Austin. Opinions are everywhere about BJJ schools and styles. Gracie Barra has a reputation for being a bit more sport oriented, which was fine by me, what with my tourney coming up. 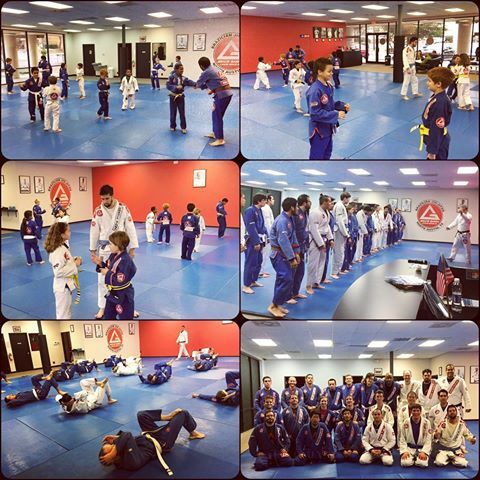 They have a nice large open space, with a bunch of colored belts who were very inviting and supportive. They were gracious enough to let me train there the week I was in Austin. I trained with Anthony Leon, who's identified on their website as a Purple Belt, but who had a Brown Belt while training. I might could be wrong about that. Either way, he's a beast, but very humble. We went over this North-South (69) double bicep slicer/compression lock, that I really can't even explain let alone find a video to describe it. Point is, it's a cool space with some very friendly people. Technically, this is my second Jiu Jitsu by the Bay. Last time, in April at JJbtB 22, I made weight, showed up, checked in, and then waited hours. I had work travel plans that night for a project out in Austin, Texas, so I was on a schedule. I was supposed to fight at around 1 in the P, but they didn't call my name until after 3:30 in the P, by which time I'd already gone. (Oscar, my teammate, told me. He stayed and took gold in his Blue Belt division.) They were running pretty far behind and it was hot and a mess, and I thought, man, I don't know about JJbtB. Their rep is that they are pretty lacks. 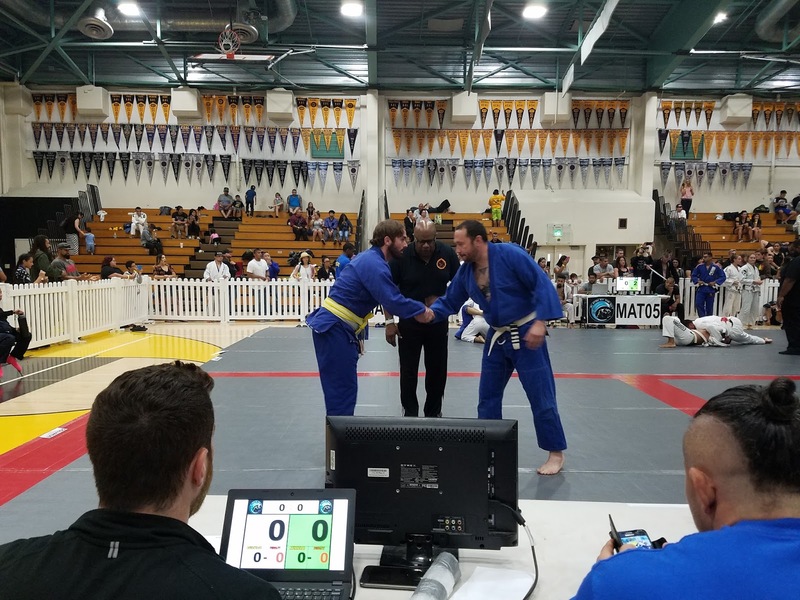 But, hey, they've been around for ages, everyone knows it, and you know, I'm still a White Belt, so many of the bigger tournaments, they don't even let White Belt's compete. Try to keep the pool small so things run on time. Though, they never do. Nothing is on time in the fight world. Except for Vasyl Lomachenko's striking. Man, that guy is amazing, but that's another post. So, I wasn't expecting organization when I showed up at the Alemeda High School Gym. They'd even made a blog post about why they run so slow and well... they weren't planning on doing anything different, just better. I'd already gone out and worked on this year's Burning Man Temple that morning in West Oakland (yet another post), so I just popped over to the tourney. And right off the bat things were different. First, there was less people, which makes it easier to keep things moving. It's the middle of summer, so, you know, lot of people vacationing. But they checked me in right quick, they had two check-in sections instead of a cluster of confused people with iPads they couldn't work. I made weight, was actually a few pounds under, and had skipped breakfast, so Angel suggested tacos. Keep it small. I really don't like to eat before I workout/roll/train. Makes me nauseous and well, I've thrown up during training before. So, my rule is not to eat for at least an hour before training. But since I'd just checked in and last time they took three and a half hours to call my name, I figured I had time. I shoulda known. Right after we got back from a taco shop down the street, they called my name. I was matched up and on the mat and then off within an hour and half of checking in. But it wasn't cause of no taco. I was totally under prepared. In Muay Thai, everything slows down. I don't know if it's cause you're anticipating strikes more or maybe with BJJ you can take a moment to breathe, but in Muay Thai, two minutes lasts FOREVER and the last thirty seconds? It can feel like an hour. But in BJJ, everything goes FAST. True, it can feel like forever when you're on the bottom and a big guy's sitting on your chest. But even then, it's not like getting knocked around for ten seconds. Met my opponent: big guy named Mat. Don't remember where he trained. We shook hands and then right into it. I did well for the first part, he went for a takedown, stuffed it, he transitioned to a Guillotine, shut that down, tried to take my back, turtled up and blocked the hooks. Then I tried this fancy escape that woulda left me on top in Kesa-Gatame, if I hadn't fucked it up. Instead I went from Turtle right into his Side Control. After that it was all downhill. We rolled around for a while, he took my back, then straightened me out, went for the Mata Leão (rear naked choke, but I like how the Brazilians call it), I tucked my chin and fought for hand control, but he just pulled. Nasty neck crank. Not that I'm saying he was dirty, he was going for the choke and I allowed myself into a vulnerable position. Guy was strong and dominate. I just wasn't prepared. I trained well, had good conditioning, though my opponent was strong. We talked afterwards and he was like, yeah, that's how it is the first time. Don't really know what it's going to be like until you do. You're in there and get a big adrenaline dump. Had to remind myself to breath in the middle there. Same thing happens in MT. There's lights and people yelling, but the hardest part for me is not being able to warm up. Not so much physically, but psychologically. One second I'm sitting there on the mat, the next, this guy is trying to choke me out. And I felt that taco getting tossed around in there. More of a distraction than anything, but still. There was no one else in our division, so one roll and done. He got gold and I got silver for tapping out. Nah, I got it for showing up, which you know, it's a thing man. What I was most unprepared for though was the speed. Not of his moves, but how you have to go right for it. No really feeling out, you do that on the ground. You gotta go for a takedown, make a move, set the tempo. Just like in chess. Looking back, feel like I was standing there with my mouth wide open. Was way too reactive. Wasn't upset over the loss. I mean, wasn't happy, but mostly I was disappointed I didn't get to roll more. Really didn't get to Jits at all. Mostly grunt wrestling. But it's all good. Now I'm just hungry for the next one. But not tacos. Was down in the New Mexico last week and I got to train at the Albuquerque Gracie Barra location. I think this makes it four Gracie Barra locations I've trained at: Austin, Texas; Santa Fe, New Mexico; Flagstaff, Arizona; and now Albuquerque, New Mexico. Overall, I like the Gracie Barra schools. A few of them throw too many techniques at us at one time, but the day I trained in ABQ we went over a single move with some variations. Don Ortega (3rd Degree Black Belt) taught class and went over pulling someone into the X-Guard. Lucio says that there is four kinds of take downs: Arm Takedowns, Leg Takedowns, Hip Toss (think judo throws), and Sacrifices. Sacrifices are called such because for a moment, you have to do just that, sacrifice position to take your opponent down. Pulling Guard or pulling into X-Guard, that's a sacrifice move. The problem with Sacrifice moves is that if your opponent knows/reads you're going pull a Sacrifice, s/he can counter. But then everything can be countered. Except for the Crane Technique. The cool thing about Sacrifices is that if you do them right and quick you can generate a lot of momentum and thus take them down even if they do see it coming. It's a risky move, but one of my favorite takedowns is a sacrifice, and I'm pretty successful with it. I don't do it as much anymore, you know, cause you have to push yourself to learn new things, but also because it just leaves me with my opponent in my Full Guard. I'd much rather be in Side Control or Back Mount. So, the cool thing about this X-Guard Sacrifice is that there'd both a Sweep to a Pass to Knee-On-Belly or Side Control, or a little toss right into Side Control. It's a nifty little move, but there's some foot work involved, so have to go over it a bunch to get it down such that I don't even have to think about it. This video is pretty close to what we went over. Don's was a little more tricky and then after this there's a sweep or a toss, but this is pretty much how it starts.